Solar panel technology is advancing rapidly with greater efficiency and lower prices resulting in a huge increase in demand. However despite the massive investment solar panel construction hasn’t changed much over the years. Most solar panels are still made up of a series of silicon crystalline cells sandwiched between a front glass plate and a rear polymer plastic back-sheet supported within an aluminium frame. Once installed on a rooftop, solar panels are subjected to severe conditions over the course of the 25+ year life. Extreme variations in temperature, humidity, wind and UV radiation can put enormous stress on a solar panel. Fortunately most panels are well engineered to withstand the extreme weather but despite this some panels can still fail in several ways, including water ingress, cell micro-fractures and potential induced degradation or PID, this is why it is vital solar panels are manufactured using only the highest quality components. We list which manufacturers use the best quality materials and perform testing to the highest standards in our guide to selecting the highest quality solar panels. Solar photovoltaic or ‘PV’ panels are made using the 6 main components described below and assembled in advanced manufacturing facilities with extreme accuracy. In this article we will focus on panels made using silicon crystalline solar cells which are by far the most common and highest performing solar technology available today. There are other solar PV technologies available such as thin film and screen printed cells but we will not be discussing these as they have limited use or are still in development. Many well known solar panel manufacturers are ‘vertically integrated’ which means the one company supplies and manufactures all the main components including the silicon ingots and wafers used to make the solar PV cells. However many panel manufacturers assemble solar panels using externally sourced parts including cells, polymer back sheet and encapsulation EVA material. These manufacturers can be more selective about which components they chose but they do not always have control over the quality of the products so they should be sure they use the best suppliers available. Silicon photovoltaic cells or PV cells convert sunlight directly into DC electrical energy. The performance of the solar panel is determined by the cell type and characteristics of the silicon used, with the two main types being monocrystalline and polycrystalline silicon. Additionally the base of the cell can be built using different additives to create either a positive p-type silicon or negative n-type silicon. However there are several different cell configurations available which offer different levels of efficiency and performance. See more information in the complete solar PV technology review. Most residential solar panels contain 60 cells linked together via busbars in series to generate a voltage between 30-40 volts depending on the type of cell used. Larger solar panels used for commercial systems and utility scale solar farms contain 72 or even 90 cells and in turn operate at a higher voltage. The electrical contacts which interconnect the cells are known as busbars and allow the current to flow through all the cells in a circuit. Basic construction diagram of a common (P-type) silicon solar cell - Click to see more information. The front glass sheet protects the PV cells from the weather and impact from hail or airborne debris. The glass is typically high strength tempered glass which is 3.0 to 4.0mm thick and is designed resist mechanical loads and extreme temperature changes. The IEC minimum standard impact test requires solar panels to withstand an impact of hail stones of 1 inch (25 mm) diameter traveling up to 60 mph (27 m/s). In the event of an accident or severe impact tempered glass is also much safer than standard glass as it shatters into tiny fragments rather than sharp jagged sections. To improve efficiency and performance high transmissive glass is used by most manufacturers which has a very low iron content and an anti-reflective coating on the rear side to reduce losses and improve light transmission. The aluminium frame plays a critical role by both protecting the edge of the laminate section housing the cells and providing a solid structure to mount the solar panel in position. The extruded aluminium sections are designed to be extremely lightweight, stiff and able to withstand extreme stress and loading from high wind and external forces. The aluminium frame can be silver or anodised black and depending on the panel manufacturer the corner sections can either be screwed, pressed or clamped together providing different levels of strength and stiffness. EVA stands for ‘ethylene vinyl acetate’ which is a specially designed polymer highly transparent (plastic) layer used to encapsulate the cells and hold them in position during manufacture. The EVA material must be extremely durable and tolerant of extreme temperature and humidity, it plays an important part in the long term performance by preventing moisture and dirt ingress. The lamination either side of the PV cells provides some shock absorption and helps protect the cells and interconnecting wires from vibrations and sudden impact from hail stones and other objects. A high quality EVA film with a high degree of what is known as ‘cross-linking’ can be the difference between a long life or a panel failure due to water ingress. During manufacture the cells are first encapsulated with the EVA before being assembled within the glass and back sheet. The backsheet is the rear most layer of common solar panels which as acts as a moisture barrier and final external skin to provide both mechanical protection and electrical insulation. The backsheet material is made of various polymers or plastics including PP, PET and PVF which offer different levels of protection, thermal stability and long term UV resistance. The backsheet layer is typically white in colour but is also available as clear or black depending on the manufacturer and module. ‘Tedlar’ PVF material from Dupont is known as one the leading high performance back sheets for PV module manufacturing. Dual glass panels - Some panels such as bifacial and frameless panels use a rear glass panel instead of a polymer backsheet. The rear side glass is more durable and longer lasting than most backsheet materials and so some manufacturers offer a 30 year performance warranty on dual glass panels. The junction box is a small weather proof enclosure located near the top on the rear side of the panel. It is needed to securely attach the cables required to interconnect the panels. 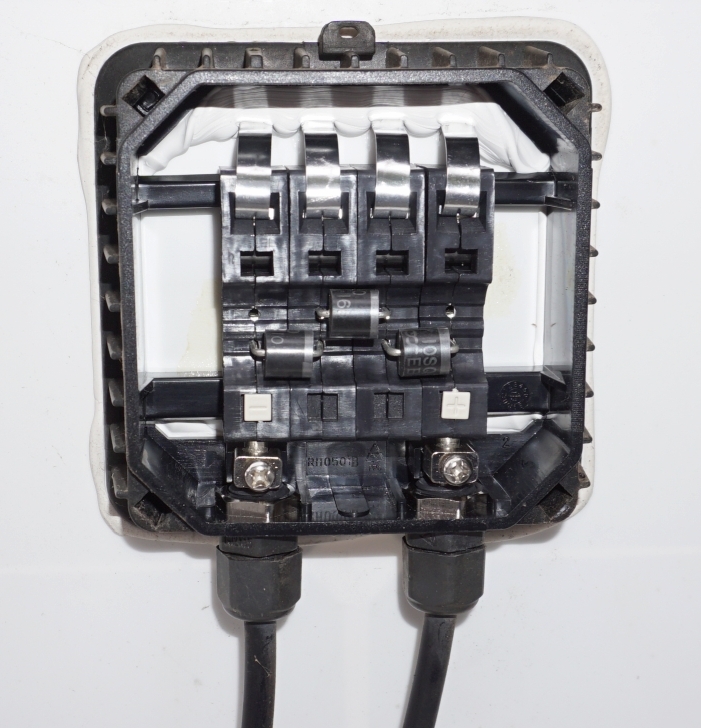 The junction box is important as it is the central point where all the cells sets interconnect and must be protected from moisture and dirt. The junction box also houses the bypass diodes which are needed to prevent back current which occurs when some cells are shaded or dirty. Diodes only allow current to flow in one direction and a typical 60 cell panel has 3 rows of 20 PV cells and in turn there are 3 bypass diodes, one for preventing reverse current to each of the 3 sets of cells. 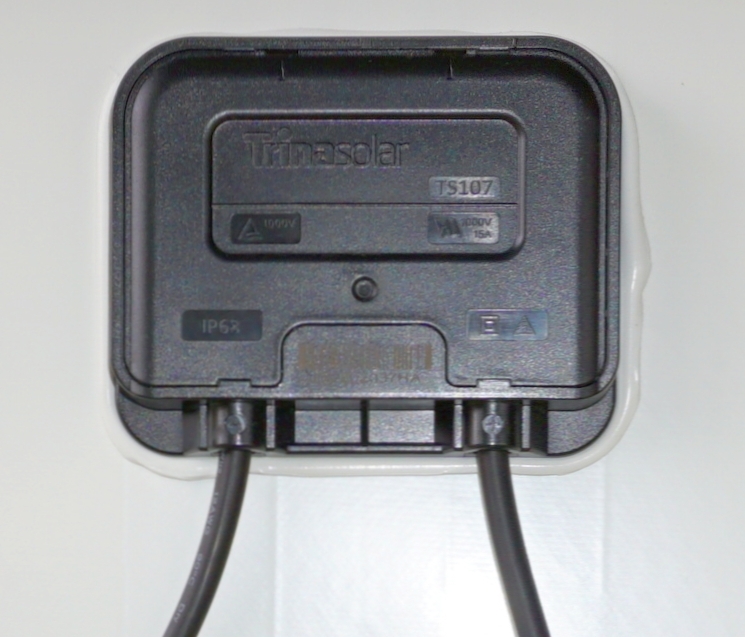 Unfortunately bypass diodes can fail over time and may need to be replaced, so the cover of the junction box is usually able to be removed for servicing, although many modern solar panels now use more advanced long lasting diodes and non-serviceable junction boxes. Solar panels are assembled in advanced manufacturing facilities using automated robotic equipment and sensors to precisely position the components with extreme accuracy. The manufacturing plants must be extremely clean and controlled to prevent any contamination during assembly. Throughout the manufacturing process the panels and cells are checked and inspected using advanced optical/imaging sensors to ensure all the components are located correctly and the cells wafers, which are very delicate, are not damaged or cracked during the assembly process. Depending on the manufacturer the final panel assembly is thorougly checked using a number of tests including electroluminescent (EL) or flash testing to identify any defects in the cells which could lead to failure once exposed to sunlight and high temperatures for many years. Below is a video from Tindo Solar, an Australian solar panel manufacturer. Sunlight or solar energy is a free source of sustainable energy unlike combustion of fossil fuels which are a finite resource. Solar panels do not produce any emissions while in use however solar panels are made of a number of different materials which require different levels of resources and energy. The energy used during manufacture a product is known as the ‘embodied energy’ and measured in years as the total energy payback time (EPBT). A typical silicon crystalline solar panel will generate enough energy to repay the embodied energy within 3-4 years of installation, however as panel efficiency increases this is expected to reduce to less than 2 years within the next decade. A common silicon crystalline solar panel will generate enough power to repay the embodied energy within 3-4 years of installation, this is supported by multiple detailed studies and life-cycle analysis. However many of the studies are now outdated as solar PV cell efficiency has increased from 14% to 18% (a 30% increase) over the last 4 years so payback time could be reduced by 1.5 years. Considering a typical solar panel will last 20-30 year’s it will easily repay the embodied energy multiple times over. In Europe the French waste management company Veolia has opened the first dedicated solar panel recycling facility in southern France which is able to recover and recycle 95% of the materials. For further reading here is a great article from RENEW about solar panel recycling.